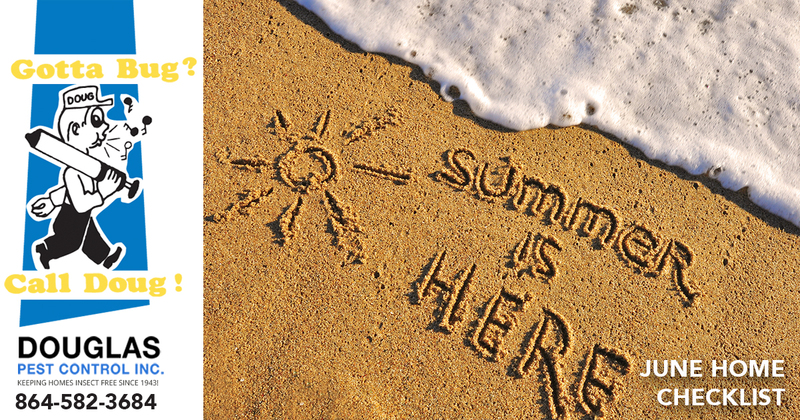 Summer officially begins today! Here are a few items for your home checklist that you can achieve in under an hour!!! This is the best way to steer clear of mosquitos. This list holds all the things you have to do before summer ends. Be sure to include going to the beach, drinking lemonade on the porch and hiking. Don’t limit yourself. Summer will fly by so have an idea of the items that you want to do. Keeping sunscreen, sunglasses, and bug repellant in a basket can help you find everything you will need without spending your time searching for it! With endless pool and beach days setting up an area in your home to dry your towels and bathing suits. This simple set can help keep your house and washing machine sand free. Everyone wants to save energy so hang a clothesline outside. Taking advantage of the nice weather and skip the dryer and use the fresh air instead. Trade the storm doors up for screen doors. Enjoy the summer breeze while you sip on a glass of lemonade. Be sure to inspect the screens carefully, even a tiny hold can be enough to let a mosquito in. Take a fresh start and move stuff around. Bring out the appliances youuse more often such as ice cream machines and hide away your fall appliances like your crockpot. Having an area set aside for those messy, sparkly crafts is perfect! It’ll make sure you are able to move whenever creativity strikes! No time like the present to clean up the house. Play equipment can start to give way. Check the swings and slides to make sure everything is in tip top shape before your loved ones start playing.